The Digiflavor Siren GTA is an ingenious single-coil RTA designed for mouth-to-lung vaping. 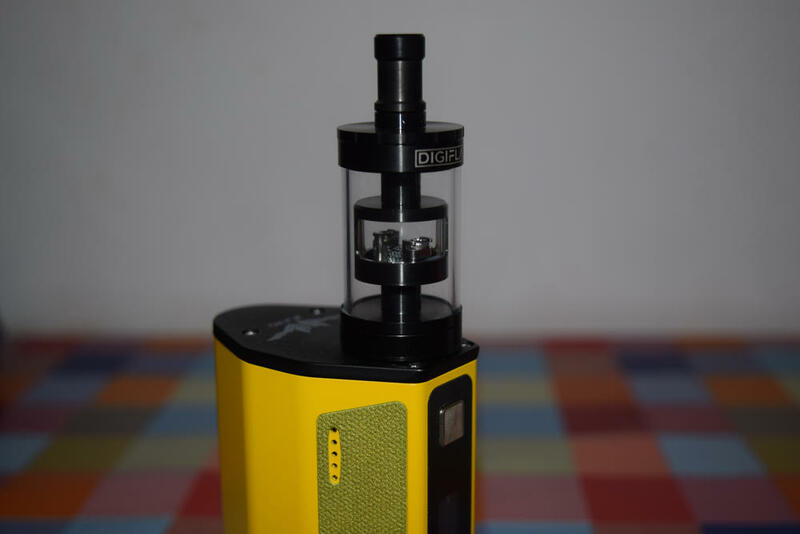 If you’re curious about the abbreviation at the end, it stands for Genesis Tank Atomizer, which means that the wicking leads extend from the build deck into the juice tank and continuously draw e-liquid to the coil. So I guess that makes it an MTL Genesis-style RTA, which is something we don’t see very often. 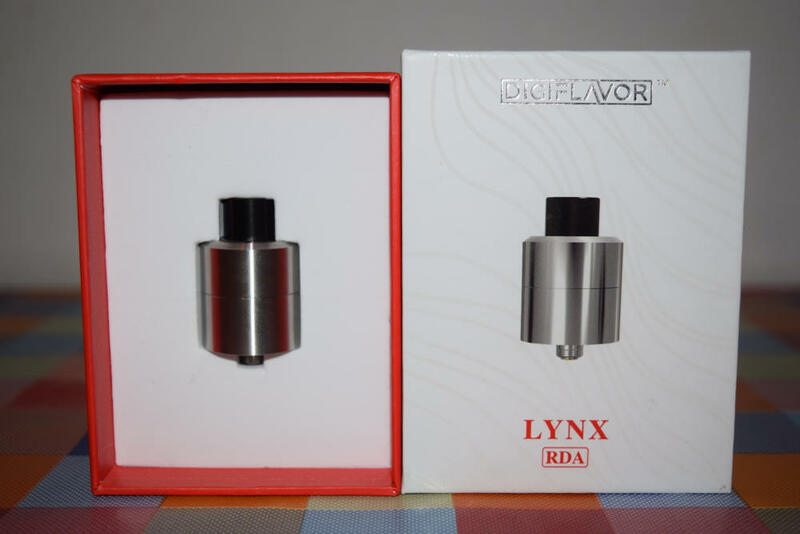 I had never even heard of the Digiflavor brand prior to reviewing this device, so I was a bit skeptical about the quality, but only until I learned that they are an offshoot of GeekVape, one of the atomizer manufacturers in the vaping industry. 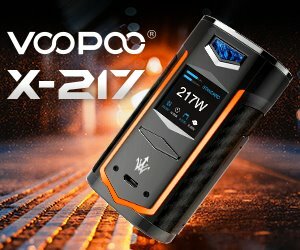 I’m not sure why they decided to build products under a new name, but as far as I know, the same experienced team in charge of design at GeekVape is also working for Digiflavor, so we can expect the same level of quality and innovation. Before we get into the nitty-gritty of this review, I have to mention that the Digiflavor Siren GTA is not to be confused with the Digiflavor Fuji. The two atomizers were launched at the same time and have a very similar look, but while the Siren is designed to be used with above-ohm coils for an authentic mouth-to-lung experience, the Fuji is meant for sub-ohm vaping. They are very different devices that appeal to different types of vapers, so make sure you don’t get them confused. 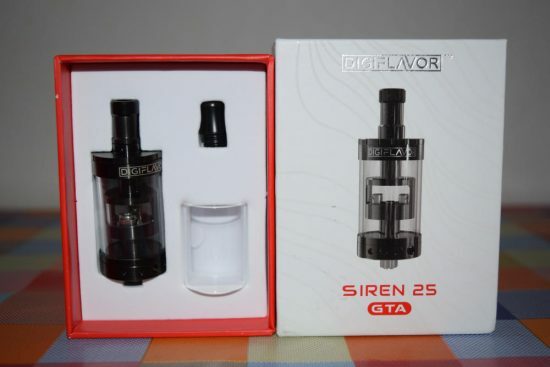 The Digiflavor Siren GTA comes in a red-and-white cardboard box featuring a life-size picture of the tank on the front, and a short description of the device and a kit contents list on the back. There is also a scratch-and-check sticker that you can use to verify the authenticity of your purchase. Inside the box, we have one Siren GTA, a spare glass tube, a Delrin drip tip, a three-head screwdriver and a bag of spare o-rings and screws. The first thing to give this package away as a GeekVape product is the lack of any type of instructions. 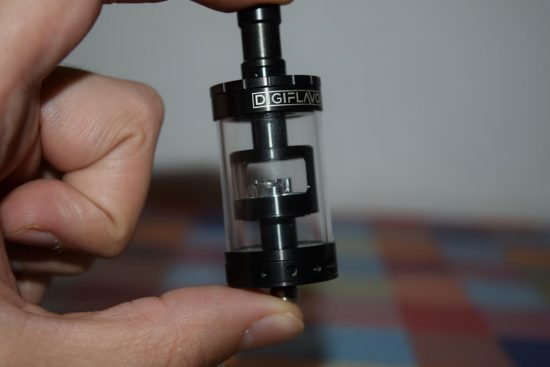 There is no user manual, not even a one page leaflet, so if this is your first RTA or Genesis atomizer, you’re either going to have to figure out how to use it, or look up tutorials online. Most advanced users probably don’t care about user manuals, but for absolute beginners and even some intermediate users, they offer some valuable information, and I for one don’t get why this company keeps ignoring them. Digiflavor offers the Siren GTA in two variants – 22mm diameter and 25mm diameter. The only differences between the two are e-liquid capacity – 4ml and 5ml, respectively – and the design of the build deck chamber, which is made of stainless steel on the smaller version, and of Pyrex glass on the larger one. Our friends at Heaven Gifts sent us the 25mm Siren for this review, and I have to say that it is definitely the most interesting-looking of the two. 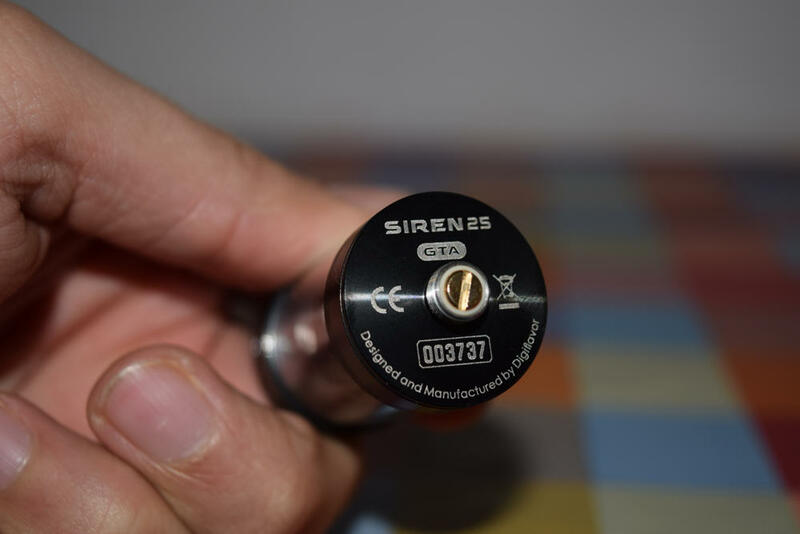 The Siren GTA 25 measures 43mm in length, from the bottom of the base to the top cap, not including the drip tip, which is interchangeable, and has a an e-liquid capacity of 5 milliliters. 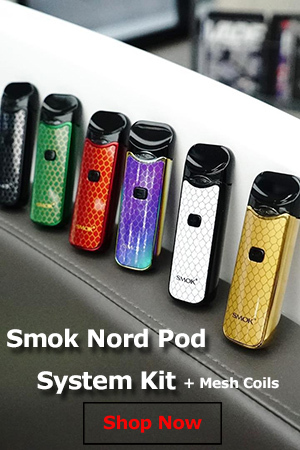 If you’re the kind of vaper who cares about aesthetics, you want to make sure that you pair this with a large enough mod, because it will most likely overhang on smaller devices. 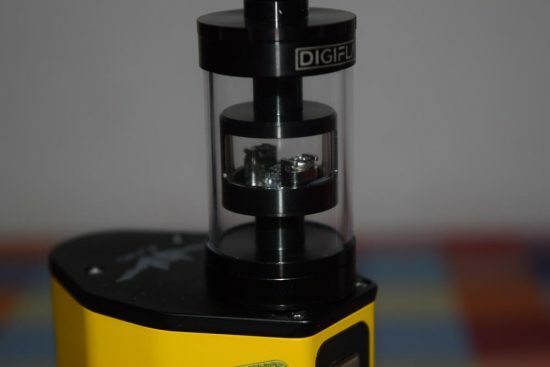 Probably the most intriguing thing about the Digiflavor Siren is the positioning of the build deck and the glass inner chamber surrounding it. 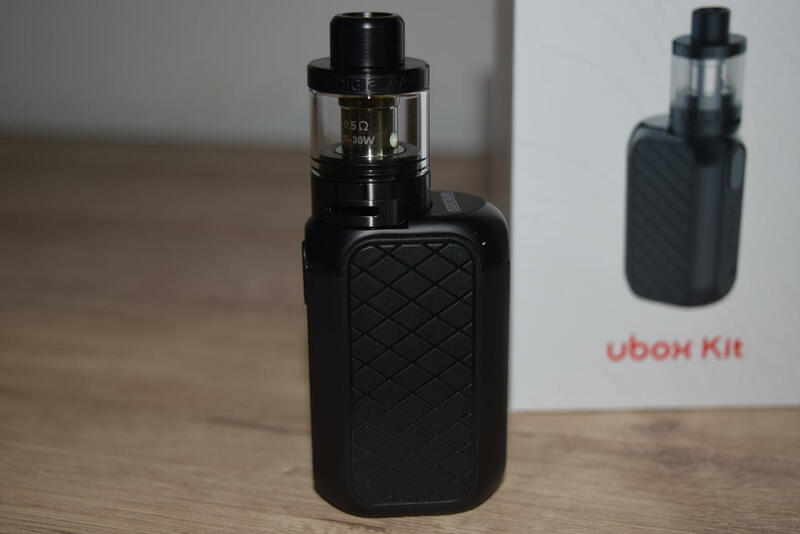 The deck is located about halfway between the base and the top of the tank, and is encased in a small glass chamber that theoretically allows you to keep an eye on the coil and the wick at all times, without having to take the device apart. It doesn’t really work like that in real-life conditions – more on that later – but it’s definitely an interesting concept. The build deck itself also has a very interesting design. The two posts have little notches carved into them, which make it easier to insert the coil wire, and top mounted Phillips head screws to fasten the coil in place. In between the posts is a large diameter air hole with a detachable airflow reducer that serves two purposes – it tightens the draw, and prevents leaking. Apparently, there is an oil film inside this reducer that prevents juice and condensation from leaking out of the deck chamber and through the base of the tank. What I can tell you from my experience is that it’s useless if you flood the chamber. The wicking slots are among the largest I’ve seen, and you’ll want to stuff them with cotton to prevent too much e-liquid from getting in and flooding the atomizer. 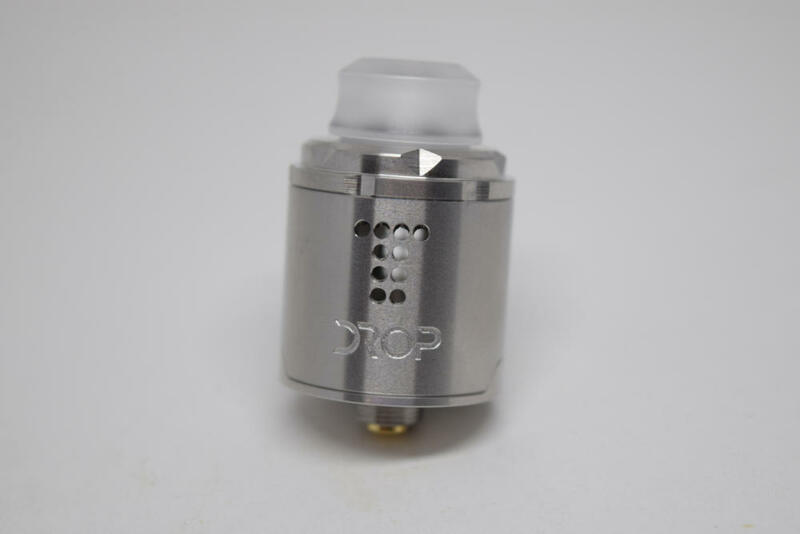 The stock 510 drip tip of the Digiflavor Siren is made of stainless steel, but has a Delrin tip that should protect your lips in case of overheating, which is very unlikely to occur in an above-ohm device anyway. It’s a bit too long and too tight for my taste, but then again, I’m not a big mouth-to-lung vaper. 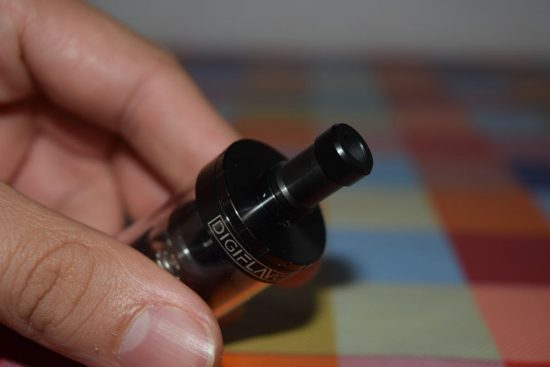 For people who prefer an even tighter draw, the kit includes a backup Delrin drip tip with an even smaller air hole. Both the Siren GTA 25 and its smaller brother, the 22, feature a top filling system that can be accessed by unscrewing the top cap. This will reveal two large fill ports that can accommodate pretty much any size dropper or unicorn bottle. 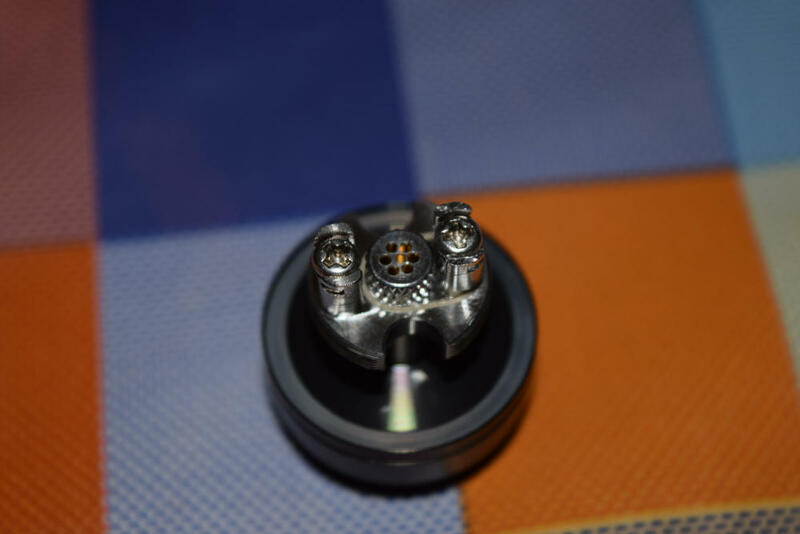 On the base of the Digiflavor RTA we have an airflow control dial that lets you switch from four increasingly larger circular holes, by turning a metal ring. Every time you turn it clockwise or counterclockwise, the dial clicks into place, so you don’t have to worry about it randomly changing position. Only one of the holes is exposed at a time, so don’t expect the massive airflow you get on a sub-ohm tank. This a mouth-to-lung device designed to offer a restrictive draw. Before mounting your first coil on the Siren’s deck, I recommend rinsing the tank with warm water to get rid of any leftover machining oil, and drying it with a paper towel. The deck posts aren’t very generous when it comes to space for your wire, and even though you might be able to fit some thinner Clapton wire through those notches I mentioned earlier, I recommend using simple wire instead. This is a mouth-to-lung device after all, so elaborate wire really doesn’t make any sense. 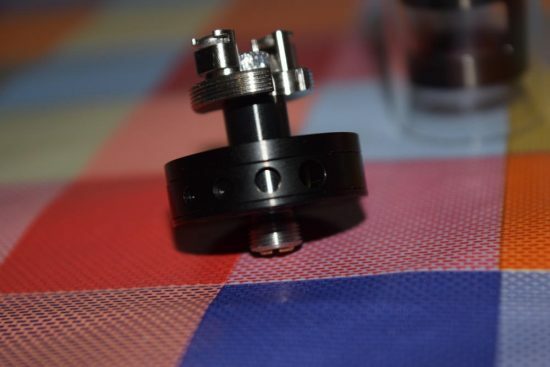 One thing you should keep in mind is that the coil should be at least 3 mm in diameter, so that you can fit thick enough cotton through it to fill the large wicking slots. Also, make sure that the coil doesn’t touch the airflow reducer located directly below it, to avoid a short circuit. When it comes to wicking the DigiFlavor Siren, the most important thing you have to do is ensure that the deck’s massive wicking slots are completely sealed off with cotton. I managed to screw up on my first attempt and the tank’s inner chamber flooded. That turned into a huge mess, as the juice got into the airflow hole under the coil and spilled through the slots on the base. I had filled the whole tank and ended up wasting 5ml of e-liquid trying to take it apart to fix the problem. From my previous experience with Genesis-style atomizers, I had learned that leaving the cotton leads too thick and too long often results in dry hits, as the juice has problems finding its way to the coil fast enough to keep it nice and saturated. But in this case, I literally had to to stuff the deck holes with cotton to prevent the flooding of the inner chamber. And instead of cutting the leads righ under the build deck, like I did the first time, I let them hang a few millimeters, about halfway between the deck and the base of the tank. That solved the problem and I didn’t get a single dry hit, so don’t be afraid to stuff those massive wicking slots with cotton. Once you’re done with installing the coil and wicking it, put the tank back together and fill it up with e-liquid through one of the two fill ports. That’s about it. Before we get into the vaping experience you get from the Digiflavor Siren 25, I want to talk a little bit about its most striking feature – the glass inner chamber where the atomization process happens. Most atomizers conceal this space with stainless steel, for aesthetic reasons, but Digiflavor apparently decided that exposing it would be a good way to stand out in a very competitive market. But unfortunately, you’re not going to see very much, especially after the first couple of puffs. First of all, the chamber gets very foggy, as the hot coil continues to vaporize the juice even after you draw. You can work around that by sucking out the leftover vapor, but there’s not much you can do about the condensation. It starts to build up on the walls of the inner chamber, and after only a few puffs, there are so many water droplets on the walls that you can hardly see anything inside. The worst thing about the condensation is that it doesn’t go away, even if you stop vaping for long periods of time, so instead of a clear view of the coil, you’re left with a fogged up glass. You can still make out the coil and wicking on the inside, but it’s not the clear image I was hoping for. Another thing I noticed about this inner chamber is how close it is to the glass tube of the Siren tank. So close in fact, that the air bubbles forming in the lower part of the tank have trouble finding their way to the top through the narrow space. Small ones do float up eventually, but some of them will merge into larger bubbles that remain at the bottom until you flip the tank upside down. Not doing so can prevent the e-liquid from reaching one of the cotton leads. But despite these shortcomings, the Digiflavor Siren 25 performs very well, for a mouth-to-lung atomizer. The flavor is amazing, and vapor production is above-average for a device designed to be used with a single above-ohm coil. It’s nowhere near what you get from a good direct-hit RTA like the GeekVape Griffin RTA, but it’s decent, even for someone who doesn’t like mouth-to-lung vaping, like me. The one thing I would like to see improved in the 2.0 version, if they ever decide to launch one, is the airflow. Even set on the largest airflow hole, the draw is still too restrictive for my taste, and the tight drip tips don’t help very much either. MTL fans might actually consider this a plus, but as someone who usually prefers an airier draw, I always feel the need for a bit more air when using the Siren 25. Overall, the Digiflavor Siren 25 is a very interesting RTA-Genesis hybrid that offers a great mouth-to-lung vaping experience. The flavor I got from this thing was amazing and the vapor production from just one above-ohm coil was nothing short of impressive. Despite its minor flaws, the design of the Digiflavor Siren 25 is just gorgeous, with the glass inner chamber as its main draw. If I were into mouth-to-lung vaper, I would definitely consider the Siren 25 as my next atomizer. It’s easy to build on, and as long as you remember to stuff the wicking slots with cotton, you shouldn’t have any leaking problems.